He returned from exile, defeated Richard III, and was crowned king on the spot. But Henry VII had a challenge on his hands. As an author of historical fiction who also has a strong background in corporate branding, I've often considered the brands created by historical figures. For centuries, kings and queens had to create their personal brands for some of the same reasons corporations use branding today -- mainly to be memorable and likable by their audiences, and to differentiate themselves from their predecessors or perhaps pretenders to their thrones. Think of Henry VIII, for example. He was not exactly the icon of honesty, charity and good will, was he, now that history has revealed his true nature? But at the time most of the people of England would never meet him, and yet would be called upon to pay taxes and fees, and perhaps support an army going to war. He needed to project an image of strength, devine empowerment, leadership and benevolence. His personal brand, the persona the masses were allowed to know, projected exactly that. I call that personal branding, even though he was the figurehead of a powerful government much like a corporation. His persona was built around a single person whose actions could make or break the success of the brand. The basic structure of branding remains much the same between corporate and personal branding. A strong identity is created to represent the business or individual, and to suggest the value in products or activities of that entity. If the entity makes the commitment to that value and consistently delivers it, trust will develop among customers. Over time, the symbol of the brand, or logo, can by itself trigger a feeling of trust. And trust, in turn, generates more business. But there are also significant differences between corporate and personal branding, especially for an author. Corporations typically generate many products and may have whole families of brands that fall under one overarching brand, like Microsoft or Kraft. Managers of these brands struggle to create a personal connection with customers in hopes of building brand loyalty, but often fail because of the public's mistrust of corporations. That's why you see them posting in social media alongside other individuals, trying to humanize their organization. While an author may be generating and selling multiple products similar to a corporation, it is always yourself you are selling. Many readers may try one of your books, and if they like it they will look for anything published in your name to continue reading your voice, your style and your command of storytelling. It is the consistency of quality that will keep them coming back, because they trust that you will deliver, but readers also are attracted to your own values and personality. You can't go around meeting every reader and talking to them about your values, right? So personal branding can help you communicate who you are more broadly and efficiently. Branding does not mean that you run out and design a logo. Many people like to do this because it seems like the fun, easy part of branding. You can, of course, but in truth your name is your logo, and believe me, good logo design is not easy. A brand does involve imagery, but all the imagery is based on some very serious soul searching and groundwork. Once that is done, the rest falls into place more easily and you do not have to reinvent it every time you need an ad, a poster or a one-sheet. That's where the efficiency comes in. But first, what is your brand? And who are you? Many who talk about branding say it is a concise and compelling statement about what you do and how your products are better than any others. And that is one way of doing it. But the strongest and most enduring brands in the world go deeper than that. Their brands are based on values. Instead of telling customers what you do (they already know that), tell them why you do what you do. What drives you? What gets you up in the morning? What is that belief deep in your core that stokes your passion and makes you work so hard? You must find it, and it must be authentic. Write that statement, and from that will flow your mission, your tagline, your colors, your communications plan, your content. And as I said, it must be authentic. I can't imagine the difficulty for an author to constantly project a persona that is not real, because the truth will show up in your writing anyway. If social media had been around in King Henry's time, no number of portraits, statues or proclamations would have sufficed to maintain his brand against the tweets, instagrams and blog posts that would expose him. Today I'm starting a series on royal branding, taking a playful look at some of the kings and queens who created strong personas to support and protect their leadership, and what we can learn from them. More to come! 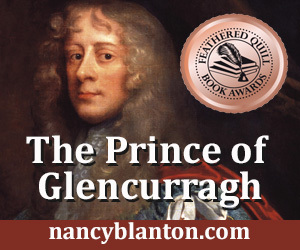 Sharavogue recently won first place for historical fiction in the Florida Writers Association Royal Palm Literary Awards! You can purchase a copy from online booksellers and at the Book Loft on Amelia Island, FL. I will be presenting at the Amelia Island Book Festival Feb. 20-21.